Database Soup: Time for a change of slogans? So the folks at DatabaseFriends, a blog I was completely unaware of until now, posted a survey whose results surprised a lot of people. In a "favorite database" survey, PostgreSQL came in ahead of MySQL and MariaDB combined. And not just a little ahead, but 2X the votes. These results don't particularly surprise me, at this point. I've seen MySQL declining in popularity since before the Sun acquisition (and precipitiously after the Oracle acquisition), and even the heroic efforts of MariaDB/SkySQL isn't going to turn that trend around. I think the booth picture above really says it all: that's in the middle of the show day at SCALE. 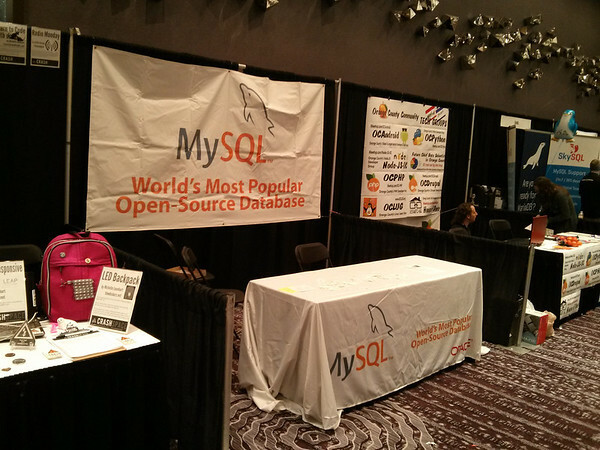 The "most popular database" booth is deserted by staff and attendees alike. (To be fair, the SkySQL booth was somewhat busier). Now, you can say what you want about the unscientific nature of the survey. But the core PostgreSQL community didn't organize a write-in campaign; heck, we didn't even know about the survey until the results were posted. And frankly, it's the same kind of thing I've seen from other sources: the Freshmeat stats from 2005-2010 for click-throughs (sadly, no longer online); the report from 451Research showing former MySQL users migrating to PostgreSQL. Now, MySQL still has a huge installed base (still, at this point, something like 4X that of PostgreSQL), so it's not going away any time soon. And MariaDB is winning new users. But I think it's time that MySQL had a new slogan, because it's pretty clear that the old one no longer applies. I like our slogan - a lot. But I don't mind being popular as well as advanced, either. I think he's suggesting they need to change their slogan ... not us! How about we just take out the qualifier? That would be DB2. Still, PG is the most advanced OS database. Really? Sure, DB2 has some features we don't, but vice-versa is also true. And there hasn't exactly been a torrent of database innovations coming out of IBM over the last few years. How about a slogan that doesn't claim anything ridiculous like "The worlds most..." and just make it more logical and fail proof. My mom said; "You're the worlds handsomest man ever" but I think I'll pass on that tattoo.